...Depends on who you buy it from, as it is essentially the sellers responsibility to make sure that you get a good one. Having watched far too many samurai movies as a lad and continuing to be an anime fan as an adult, I knew that it was only a matter of time before I owned a katana. And not the Stainless Steel kind that I already had. I wanted a real katana, something that I could be proud of. At this point I had just purchased the Gen2 Irish Hand and a Half sword, which I was in love with (and still am), and I only had about 100$ to spend on another sword. I began looking through the real-but-not hideously-expensive katana market, and found Masahiro as a credible and reliable dealer. I thought about their Heron model, but didnt like the brass tsuba. I thought about the Ikusa model, but wasnt a fan of the red ito. It came down to the Sakura in standard black or the Uma with brown trimmings. Having not found Sword Buyers Guide and supped at the table of Pauls Wisdom by this point and going on gut and price point alone, I ordered the Masahiro Sakura Katana from Kult of Athena. I received it less than 10 days later in the fastest order I ever placed. The sword ran for 119$ regular but was (and still is) on sale for 89.99$ USD. 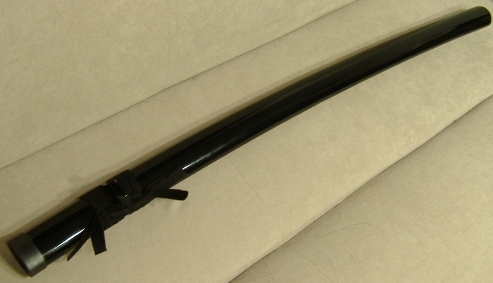 Just for kicks I added 2 bokken to the order, and a pair of sais for a friends birthday. Gotta have variety. A word on what attracted me to this weapon: I was pretty sure that the blade was going to be the same across the board in most of the Masahiro models. But the simple grace of the tsuba, the plain black of the fittings all seemed very refined and understated to be. I had a feeling that this sword would be an eye-catcher from across the room, not by garishness but by virtue of its plain, elegant beauty. I was not disappointed. On arrival, I was pleasantly surprised to find that the standard import/custom costs that typically get charged at the border to Canada had been, for some reason, waived. I headed back to my car with the large cardboard box under my arm and an extra 40$ in my wallet. At home, I pulled the various pieces of my order from the box  bokken, sai, and various stands  to get at the triangular Masahiro display box. Inside, the sword was in its bag packed in with brown paper. I had never seen a sword bag before and, embarrassingly, had trouble figuring out how to open it. Ironic that the sword inside could make short work of the bag. I wondered if Id have to use my Gen2 to get it open  an idea that carried with it ironies of its own. While I pondered the significance of using one sword to get at another, the knot loosened and I held in my hands my first battle-ready katana. As I drew the blade from its saya, I felt a strange humility. I knew that I was holding a symbol of some of the greatest swords made in human history, remade by modern smiths. What tradition and history were combined in my hands, albeit in a replica form. I was very excited to put this beauty to work. 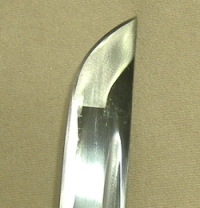 A deep bo-hi runs the length of this straight blade. The blade came sharp, but I was'nt sure if it was as sharp as I thought it would be. However, I was to put this to the test shortly, and will save my comments for then. The wire-brushed Hamon is attractive and even, though there are a few placed where it becomes indistinct and fuzzy. At least it is not in the overtly fake-looking SIN wave. Mono-tempered throughout, so its not historically accurate  it takes a -1 point loss here. The kissaki is well defined and attractive, coming to a razor sharp point that would be useful for stabbing, should the need arise. It lacks the awkward look of some low-end Katana points, and is polished  just like the rest of the blade  to a beautiful mirror finish. However, there were a number of aesthetically displeasing scratches of the blade finish, mostly confined to one side which led me to believe that they were after-market, or possibly due to shipping damage. 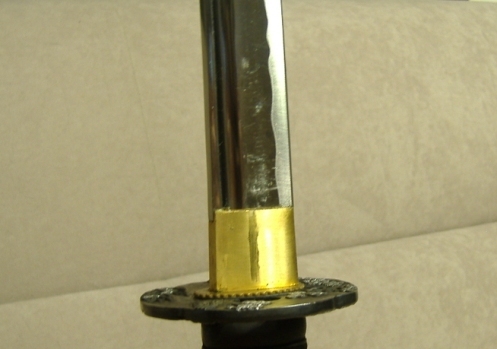 The most prominent of these was near the tsuba, where a number of fine scratches were visible (as pictured). These scratches dont affect the cutting or integrity of the blade, but are still numerous enough that Ill be displaying this sword in its saya. So -2 fit and finish points here. More on the blade when we get to the cutting tests. The tsuka is wood wrapped with imitation rayskin. I was never a stickler for that, so I didnt mind. But it takes a -1 historical accuracy hit for it. The cotton ito is fairly well wrapped and even, no complaints there. The diamond shapes are uneven at points, but without scrutiny there is no reasons to see that as anything but acceptable. The ornamentation are cast metal dragons  pretty standard. It appears to be cast metal of some sort, no frills. Not something that catches your attention either way. 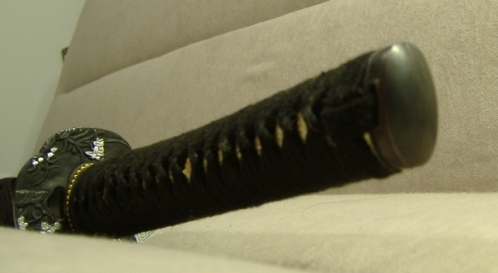 The tsuba was a huge selling point for me. It is a really good-looking piece. Cast from zinc alloy, the tsubas 2 tone Cherry Blossom design is a big hit with myself and those who have viewed it in my collection. It feels slightly plastic to the touch, but on closer examination it really shines. This is a big selling point for anyone interested in a very attractive tsuba that could be removed and married to a much nicer blade and not look out of place. Black lacquered wood, no scratches, no defects. Not much else to add there, it looks really good. 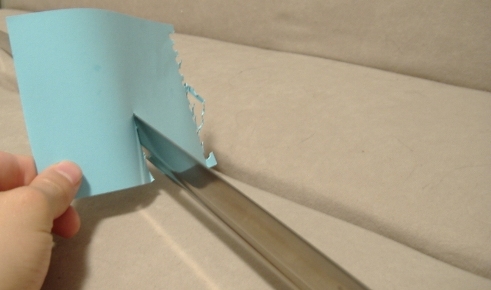 Having heard so much about how paper tests were the mark of a truly sharp sword, I honestly wasnt expecting anything to come out of it, and I selected a small piece of paper from a notebook I had. This sword felt awkward during a swing, and at first I wasnt sure how much of that was my inexperience. After some test moves and a bit of practice, the Sakura felt a bit more comfortable. Even with the bo-hi it seems less balanced than I would like it  I realize now that the tang was probably a bit thinner than it would have been in a higher-end sword, which left the POB a bit farther out than normal. Only -1 on handling, I'm sure a better swordsman than I would be more discerning but based on my experience it felt well enough in my hands. 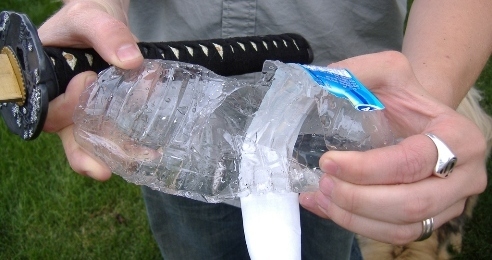 The first test of cutting a plastic bottle was also my first attempt at cutting anything. So I'm going to blame the first few swings on my form and not the katana. In truth, the first test didn't go so well. I hit the bottle at a poor angle, sending it flying off the stand and frightening my dog badly. When I held up the blade to the light, my heart sank. It had taken a fairly major (or so I thought) set, and needed some bending over my knee to make it straight. Even then there was a slight bend, not enough to affect it sliding into its saya or the way it felt in my hands, but just enough to notice if you laid it flat. This was quite concerning to me, and I spent a good while fretting over it. Maybe it was my bad form, but I'd like to think it would have been able to last one bad cut without bending. Further attempts to cut plastic bottles resulted in similar baseball-like effects, thankfully without a repeat of the awful set. As you can see in the picture, the blade cut into the bottles but did not slice them clean. It was disheartening. What about the paper test? Didn't that mean something? Heres where the blade really shone. After the plastic bottle test, I had almost no confidence in the Sakura, and decided that if it was going to bend, I was going to give it hell before it did. I had my wife film as I took aim at slightly higher than waist level, where the milk jug sat. 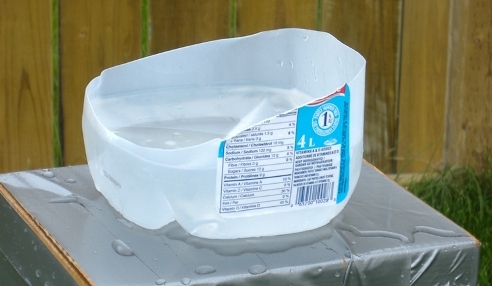 With a swift motion I swung it at the jug, only to have (to my surprise) the upper portion come neatly separated and water splashed everywhere, while the bottom two-thirds stayed put. I stood stunned for a heartbeat, then remembered to swing my blade to get the blood off. My wife turned the camera off and solemnly informed me, You're a geek. I was too busy grinning and examining the cut from every angle to care. Just to make absolutely sure it wasn't a fluke, I straightened the bottom of the jug and took aim again. This time my wife moved in closer to get a better shot of the Sakura in action. Notice the awesome cell phone that remains attached to my hip the whole way. Just like a real samurai. Yep, not a fluke. This sucker really left its mark. I felt like framing the remains of the milk jug, but decide to save them and show them to some other sword loving friends. The Masahiro Cherry Blossom passes the cutting tests; although I had no tameshigiri mats, I feel like it would hold its own against them. The fittings, tsuba and blade were just as tight as when I started, so no more structural integrity marks lost there. All in all a fine performance from this budget katana. Having paid only $90 USD plus shipping, I still feel like I came out ahead. It could have been better finished with less minor nicks and scratches, and Id be a lot happier if the tempering was resilient enough to resist a set with what I was doing. Keeping the score up is the relatively low cost and the overall attractiveness and sharpness of the piece. Recommended as an entry katana for light cutting only. The best place to buy Masahiro Katana is from Jason at Swords of Might - not only are his prices better than anywhere else (he sells the Cherry Blossom here for US$56) but he is also well known to his customer base for extraordinary customer service and going the extra mile.